Maeve Hickey's photgraphic work depicts the borderlands of the United States and Mexico, the influence of America in Ireland, Chinese life in Ireland, and a range of other subjects. 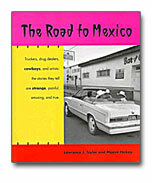 Work done along the US-Mexico border culminated in international exhibitions and the publication of three books. Scenes of life in the "twin" border towns of Nogales, Arizona and Nogales, Mexico. An exploration of the multiform presence of Americans and American culture in Ireland. A celebration and exploration of the increasing presence of Chinese people and culture in Ireland. Behind-the-scenes, performance, and portrait photographs from the famed circus. A study of the ancient and continuing and powerfully spiritual interaction of people and place, in Ireland and beyond. Black and white images of the desert landscapes through which migrants trek, and the objects they leave behind. A photographic journey with the Tohono O'odham tribe. Black and white portraits of homeless youth on the US/Mexico border. A narrative of Maeve Hickey and Lawrence Taylor's encounters while traveling the road that links Mexico and Arizona.